An armed man has robbed a supermarket in Shropshire, police have said. West Mercia Police said the man ducked the shutters at the Nisa store on Queensway Drive in Bridgnorth as staff were shutting the store at 21:00 GMT on Sunday. He threatened staff with what police said looked like "a small handgun" covered by a plastic bag. Staff were forced to empty the till, and the man escaped with around £200, a spokesperson said. 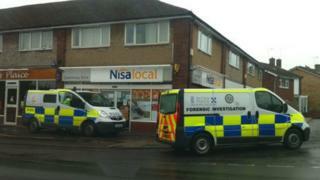 Police said the robber was aged between 45-55, 6ft (1.83m) tall and stocky. He was wearing a cream and light blue jacket over a hoodie, and had a scarf over the lower part of his face, the spokesperson added.